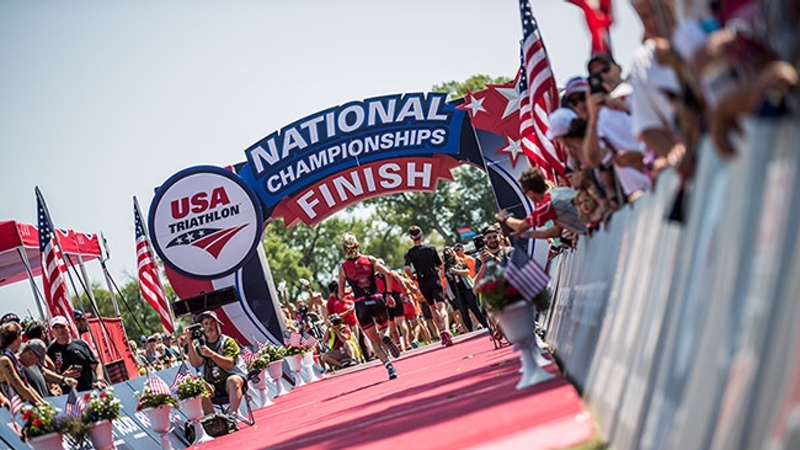 USA Triathlon (USAT) has opened registration for the sprint-distance race at next year’s USA Triathlon Age Group National Championships, to be held on August 10-11, 2019, in Cleveland, Ohio. As in 2018, the weekend of racing in 2019 will feature an Olympic-distance championship – on Saturday, August 10, for which athletes must qualify to compete. Saturday’s race will feature a 1,500m swim in Lake Erie, a 40k bike in the neighbourhoods of downtown Cleveland, and a 10k run finishing at Edgewater Park. Racing will continue on Sunday, August 11, with a sprint-distance championship that covers a 750m swim, 20k bike and 10k run. Registration is now open through ACTIVE for next year’s sprint-distance race, which has no qualifying criteria. Registration for the Olympic-distance race will open to qualified athletes in the coming weeks, with the qualifying window to remain open until approximately eight days before the 2019 event. Top finishers in both the Olympic-distance and sprint-distance races will qualify to represent Team USA at the 2020 ITU Triathlon Age Group World Championships in Edmonton, Canada, in their respective distances. Since 2000, the Greater Cleveland Sports Commission (GCSC) is responsible for attracting more than 170 sporting events which have contributed over US$500 million in economic activity to Northeast Ohio. The GCSC supports the local economy, utilizes sports as a vehicle to forward community agendas and maintains a goal of ‘producing events that are more successful when held in Cleveland than in other cities’. Cleveland has a rich history of hosting premier national sporting events, including the 2007 NCAA Women’s Basketball Final Four, the 2015 NCAA Men’s Basketball Midwest Regional, the 2017 CONCACAF Gold Cup, the 2018 NCAA Division I Wrestling Championships and several other national competitions for sports within the Olympic movement. Cleveland has also been selected to host the 2019 MLB All-Star Game. The city is home to the Rock & Roll Hall of Fame as well as three major professional sports teams. Visitors can see a show at Playhouse Square, the largest performing arts centre in the US outside of New York City, or visit the West Side Market, which features more than 100 vendors selling local produce, spices and authentic cultural foods. Outdoor enthusiasts can spend time on Lake Erie, visit one of the 18 reserves of the Cleveland Metroparks that surround the city, or drive south to the Cuyahoga Valley National Park.